With bright, bold lipstick being such a big trend (and always a staple in our arsenal of looks), the matter of keeping our teeth as pearly white as possible is extremely important. Just about every lip color looks better when put against sparkly white teeth — not to mention the fact that yellowing teeth can be a bit of a confidence killer. Whitening can be a big investment, and even though it’s worth the outcome, we always prefer to DIY what we can (to save our money for more important things, like highlights). 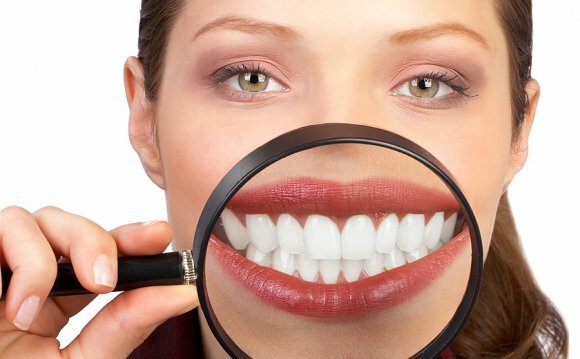 In an effort to help your smile shine as brightly as your personality, we’ve put together eight must-know tips for DIY teeth whitening below! 1. The Mouthguard: One simple trick is done with the use of a mouthguard for teeth whitening. Mix baking soda and lemon juice (and a little bit of water if needed), then fill up the mouthguard with the solution. Leave on for 10-15 minutes, then wash off the residue to reveal some bright, white teeth. 2. Fruits Are Essential: Opt for a piece of fruit in the morning to give your teeth that beautiful glow. Strawberries are especially great for starting the day on a bright, white note. 3. Don’t Toss The Floss: Every time we go to the dentist we get free floss and toothpaste, and often times end up just throwing it away. Flossing is a huge part in keeping your teeth white because it gets rid of the stains in between the teeth, so instead of tossing in the trash, toss the floss into your purse for some on-the-go whitening help. 4. Chew Away: Gum containing xylitol helps to achieve pearly whites. It’s a natural sweetener that can actually help to prevent plaque. While plaque feeds on regular sugar, it can’t digest xylitol. Xylitol also neutralizes pH levels in the mouth and increases saliva production, so your teeth will be brighter than ever after you chew. 5. Head to the Cheese Platter: There’s a growing body of evidence indicating that eating a small amount of cheese after a meal can potentially help to prevent tooth decay and promote enamel re-mineralization. Any excuse to eat the burger with the cheese is good in our book! 6. Paint Your Teeth In Petroleum Jelly: Though this doesn’t sound as fun as eating cheese (sigh), it’s been noted that by coating your teeth with a layer of petroleum jelly you can block stains from occurring. This is really just for extreme circumstances, but more power to you if you can stomach this on an average day. 7. Follow What the Packages Say: Opt for a brand that says “whitening” on the box when buying toothpaste, mouthwash and floss. They’re made with whitening agents and if you’re going to be going through the motions anyway, you may as well multi-task. 8. Keep Toxins Away: It may seem obvious, but avoid smoking or chewing tobacco, which yellows and completely ruins your teeth.